Editors: Van de Graaf, Thijs, Sovacool, Benjamin K. and Ghosh, Arunabha et. Al. This Handbook is the first volume to analyse the International Political Economy, the who-gets-what-when-and-how, of global energy. 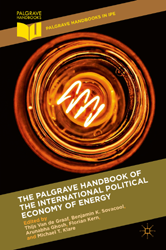 The Handbook serves as a potent reminder that energy systems are as inherently political and economic as they are technical or technological, and demonstrates that the field of IPE has much to offer to studies of the changing world of energy.